Snow all around you, while you are wrapped in all kinds of warm clothing... the wind hitting your face.. chilling whatever part of your body is exposed.... :) Its fun. Then there were these small little trips through the market place..all covered with snow. Everything was white. Literally everything. To add amazement to fun, there was a meeting planned in a meeting room on fifth floor. And, the room had big windows facing the market area. When someone looks out from that window, there is still the same old city, but all the colors are gone. Its just one universal color all over the place. ALL WHITE. I took many photos. Some with my SLR, some with my phone.. Can't upload them now, but yeah, they will show up.. for sure. We went to one of the indian restaurants which Manoj had be-friended on his last trip here. The walk to the place was fabulous. The footpath was full of snow, like a blanket. The little gardenetts/bushes along the footpaths were all topped by snow. About two-three inches of that. Some of these places turned out the be pretty dangerous. Snow had been crushed by walking people and some of it had become ice. A thin layer, but very slipperty to step on. If you are unlucky and step onto one of these patches, be very careful. I just about fell into one of these traps. On another day, we went walking through the city center to the other part of the town. That part is rather sparsely populated and therefore, its more parks, open areas, greenery etc. And, to watch it in snow was just amazing. Lots of photos again. On the friday today, streets are more or less clean of snow, howeverm some plants, treetops, and standing cars in parking still have inches of snow on them. the temperatures are not going up more than a degree or two. Lately I found that we experienced things in the range of -5 to -6 degrees celcius. Oh...wow... that's a city.. Believe me, you need truck loads of money to live there.. And enjoy its markets. 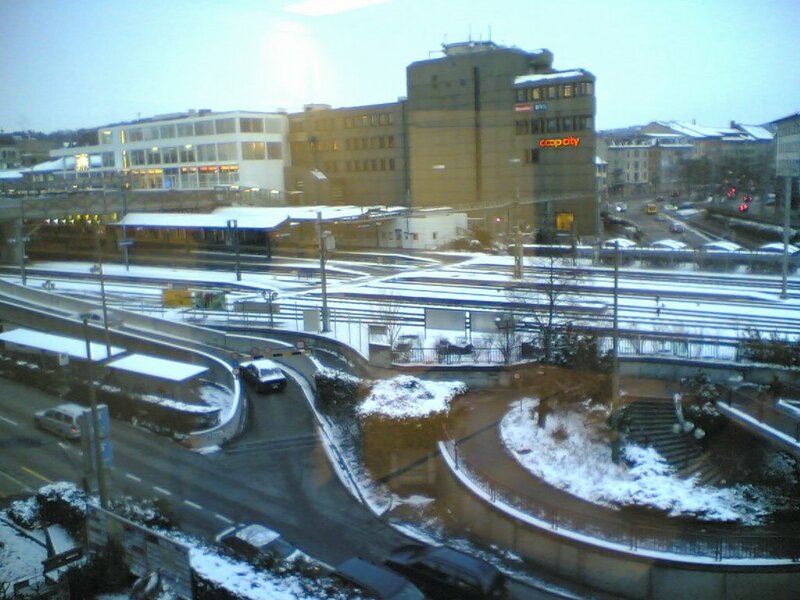 When I left Winterthur, it had already started snowing. And I felt very good within. I like going out in snow... and taking photos... and playing with snow balls. Unfortunately my wife is not with me, so I couldn't expect playing snowball, but I still wanted to go out in snow and enjoy. The train station at Zurich is big. And has a complete shopping complex within it. I mean, if you are not careful enough, you might as well lose yourself. On top of that, all the Christmas shopping rush (both of people and makeshift shops) gets you even more confused. I got out of the place to meet a very sullen lady at the tourist counter. She helped (?) me with a city map and started doing whatever she was doing. So, with that map in hand, I was on my own. I had already bought a rucksack in the day (35 SF) . The BahnhoffStrasse is probably the biggest fashion street in the world. I could name any fashion brand out of my mind, only to find the shop somewhere around me. So I went on. The idea to convey is, every brand worth something was present there on the shopping street. Having one (or more) showroom in the kilometre or so long shopping street. All this while it was snowing slowly... making it even more "experience of life" situation for me. Then I left the main shopping street and went looking for the river Limmet. Sounds like a Jewish name to me, but can't say. I found that it’s a very shallow river. A few feets only. Actually while photographing the ducks in the river, I could spot the riverbed. And that's how I figured that out. There were two - three high rising churches... Gross Munster, Frah Munster and one more.. Later I learned that "Munster" means church or ministry in german. The Grossmunster is perhaps the tallest of the three and has two towers. One of them is open for public to go up and enjoy the city sight from that point. As I always like, I went up there. And I liked what I saw. It was a fabulous view of the city bathing in light snowfall. On one hand I saw the city buildings, houses, streets, the river and on the other hand I saw the monstrous Zurich Lake. It was snowing so I could not spot the other shore of the lake, but I guess, it would have taken some effort for me anyways, once I realized how big the lake was. After Grossmunster, I continued my walk towards the lake head. The point where the lake cruises start. My day-pass included the boat trip price as well. While crossing one bridge en route to the place, I saw a lady feeding pigeons and ducks. The birds were thronging the place like anything. It was having about 80-100 birds at that place at once. I took some more photos there. For feeding there, the pigeons flew to the fence and stood there in a queue like formation. More photos there. Then I took the boat cruise through the Zurichzee (Zurich See) as they call it. Funny thing is the imagination of scale of these people. A lake as big is that, and they call it a see, go to other places of world and you would see lakes times as big as that. I would say, that this scale problem exists with the complete Europe as a culture. The people here really lack that vision that there could be something as different or big from their own country. E.g. in Brussels, I spoke to a colleague who was amazed to know that the complete country of Belgium can be fit in one of the larger cities of India or a larger city of Delhi. The trip thorough the lake was made even better by the snowfall. There were moments when the snow fall was so thick that vision was impared to a few meters and then it was better to a few kilometres. Amazing for me to see that kind of weather change in a matter of minutes. It was a ride worth taking while it took about two hours or so.. I actually took a little nap while on board. When we got back to the shore, the snowfall had stopped momentarily. The place was full of snow cover, everything was white. Just like that. Fun to watch. Then I started my walk again. This time I took the little trip through the shopping street again.. on the other side of road. I found a camera shop… and it was a very expensive one. No discounts in the name of Christmas period etc. EOS 350D was still 1398 SF as advertised from Canon. Further on the walk I found rare presence on super market Co-op and Inter Discount. Both of them are big discount shop chains across Switzerland (so I have learned in the previous week). I went inside Inter discount one, looking for… nothing.. basically. Electronics being my craze. I looked around for USB storage sticks. Found some very interesting ones there. Swissbit, 2 GB was about 220+ SF while Sony were selling their 512 Mb (with password protection) at about 100SF. Then there were local ones as well. I looked around the camera section, and found EOS 350D priced at 1200 SF. Suddenly, it was interesting for me. Then I asked and found out the actually it was a catch, since there was no standard packages along with it. And the standard deal from Canon (the photo printer, priced at 150 SF) was not with the deal. And I dropped it… J Anyways I was only looking for stuff. Then I went back to look at the Framunster. This church boasts stained glass windows by Marc Chagall. Having heard the name a lot, I was curious. I went in and found it a bit anti-climex. Nothing special for me. That quite summed up usage of my leg strength. So I headed back to bahnhof for going back to hotel. I took a tram (they are pretty old trams here, from the look, but are well maintained). When I got down, it was all illuminated and snowing very heavily. Then I realized that on the main shopping street, they have this lighting system installed. It was such a magnificent view that I was just dumb stuck. On the main street, there were cylindrical lights installed vertically. And, they were not standard tube lights. They were actually synchronized lights, with patterns flowing along the street. So, if you watch it for a few seconds, you would realize that a pattern is flowing from one point to other of the street. Each of the tube light was working in the combination. Marvellous. Then I went inside and took the train to Winterthur. It took me about 30 minutes to reach Winterthur station. 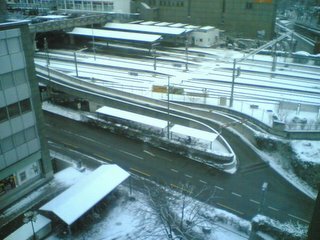 There had been heavy snowing in winterthur city. Till the next day morning, an inch of snow is still remaining. 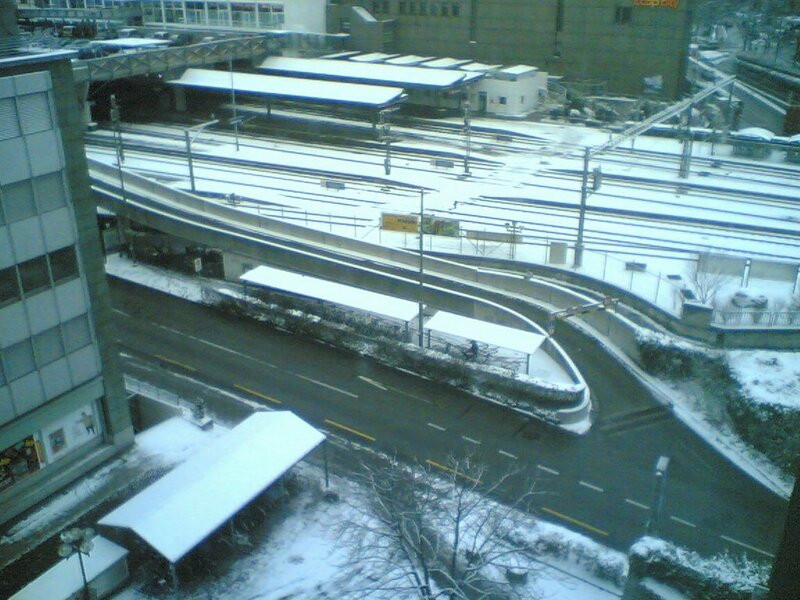 Finally I decided to rely on the forecast and believing on the snowfall, I would go to Zurich on Sat. Sunday Neeraj and Manoj should be here, and therefore things would move based on collective plans and preferences. I arrived at the hotel about 10:30 in the morning. Took a bath and then planned to sleep. But, me.... knowing myself, didn't dare sleep. I prepared myself for the cold and went out in the town. To look around, what;s there, how different or similar it is to what I have already seen. What I found was pretty much similar to my expectation of a typical European city. Almost similar names (store brands), same kinds of super markets, not much different. I somehow was expecting more Jewish effect on the city, which I could not spot myself. Somehow I have this mental image about Switzerland, which is very closely linked to Jews. Somewhere down inside me, I respect them a lot for their skills. And, having known Islam (more negative than positive), would like to know lots more about Jew-ism. But, I did not find any traces of Jew-ism (that I could spot). Though I have to admit that I hardly know anything about visible signs of Jewism. I had seen at least two people at the airport, looking at which I could straight away say that they are Jews. but afterwards nothing. In the town here also, nothing. I walked across the city's shopping area... which was open on a sunday in preparation of the upcoming Christmus shopping season. But I did not see the kind of rush I have seen in Brussels. I thought ... a new town, a new trend.. let's see.. It was very cold, and I was worried about my preparedness while going out. I forgot my gloves that time and paid heavily. i could realize the mistake almost immediately. I have this habit of not being able to go inside a shop if I don't have to buy anything (genuinely). And I have seen myself spending quite a bit of money just because I entered the shop and shop keepers (or salesman) have spent some time on me. I feel it like an obligation. Therefore, I developed a need of buying a USB memory stick. I actually needed (still) one. So, I started entering electronics shops and looking for it. The exercise where I have to make something understand to someone who doesn't know english (and I of course don't know his/her language) is very interesting for me. I love that. And here I had the perfect opportunity. Alomost no-one in shops knew english good enough to understand my point in the first attempt. Then it was genuinely the internal fight that I always have about the size of the stick. I have this tendency where I try to avoid being limited by capacity of anything. If I have to buy something, I would rather have it the maximum size (or multiple uses ) possible, even if i have to pay extra money. e.g. Last time I went out to buy this USB stick (in Brussels), I ended up buying a complete Sony VAIO Pocket kit (which I still regret(: . At that time it cost me 450 Euros. Somehow, I knew immediately afterwards that it was a bad decision. I had never been to Switzerland, and never wanted to, without my wife. This time work made me come here.. for two weeks. Arrived on 11th dec. All alone, though I have travelled all alone before (while living in Brussels), this was a little bit different. And I liked it. The flight exchange. For the first time, I needed the currency exchange while arriving in a foreigh country. Earlier always got money in the local currency from the travel desk. Then looking for the train connection from Zurich to Winterthur. The trains here are much similar to those in Belgium or Netherlands. I guess the trains are more or less similar across Europe. whatever of that have I seen, I found most of the places having similar quality. Though Belgian trains had a little display inside the passenger wagon to display which station is arriving next, here they didn't have anything like that. All in all, an interesting arrival. The hotel, Wartmann, is actually a nice location. Just besides the train station. To me the town is also very small. But, I have actually seen very little of it anyways.